At John J. Pempek, Inc., we know your commercial business cannot afford lengthy downtime or interruptions, nor can you close your doors to accommodate commercial electrical installation. Your businesses need a commercial electrical contractor that provides a welcoming environment in which customers and employees feel safe and productive, not hastily performed work that may cause future issues or safety concerns for employees, customers, or even the building itself. The experts at John J. Pempek know the challenges our commercial electrical contracting clients face with electrical installation. Both large and small projects require a commercial electrical contractor with the experience and knowledge to do the job right while making the needs of the business a priority. Our commercial electrical installation clients receive personal and professional care that minimizes their downtime and results in efficient and thorough work, proof that they chose the right commercial electrical contractor. We perform the work needed correctly, allowing your business to stay on schedule, every time. John J. Pempek, Inc., we provide commercial electrical installation for new construction, remodeling, and 'active remodels' in which the business stays open while we perform the work. 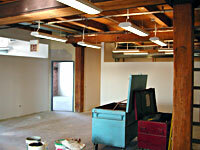 We reconfigure stores, rehab lofts, remodel offices, and provide retail focused-area rollouts. Give us a call today at (708) 361-1265 or fill out our contact form. With 24-hour customer service, we can provide the information you need for your commercial electrical installation project anytime! All Your Commercial Electrical Needs.